Wash the fish, then remove the heads and intenstines and put them in a bowl with salt and lemon until they are covered. 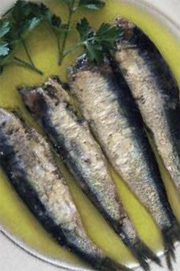 Leave the anchovy in the lemon for about 10 hours while the sardines for 24 to 30 hours according to their size. Try pulling the tail along with the spine and if it can be done and the flesh is more white than red, then the fish are ready. You can either cut them in fillets or leave them whole. Transfer the fish in a glass jar and cover them in olive oil. Springle with the garlic and parsley. These small marinated fish can be preserved in the fridge for many days.